The war finally ends and everyone is excited. María hears that her sons are returning and she cries and prays to the Virgin for hours, until all the children eventually fall asleep. María only processes the world through her specific religious framework, but it is still centered around the Virgin, a figure representing the Chicano blend of cultures. Antonio dreams of his brothers as giants, and they tell him about the wide world they have seen, and mention the golden carp, and ask Antonio to save them. He wakes up sweating and then sees that his brothers are coming over the hill in real life. The giant brothers symbolize Antonio's ideas of adulthood, but their frailty in the dream shakes his ideals. Antonio is again asked to save someone, taking up a priestly role. Andrew, León, and Eugene return and the whole family is overjoyed. María starts crying again and makes them all pray one more time. Gabriel asks the boys about California, and repeats that he wants to go there with them soon. They are reticent about both California and the war. The house feels complete with everyone home. Meanwhile at school Antonio keeps learning his letters, and Miss Maestas sends a note home about his good progress, which pleases María. The war brings harsh external modernity to the family through the change in the Márez brothers. They have seen many places and had terrible experiences, and can no longer process the world through their parents' narrow dreams. Antonio begins to fulfill his promise as a man of learning. Cosby, Matt. "Bless Me, Ultima Chapter 7 (Siete)." LitCharts. LitCharts LLC, 20 Nov 2013. Web. 23 Apr 2019. Cosby, Matt. "Bless Me, Ultima Chapter 7 (Siete)." LitCharts LLC, November 20, 2013. 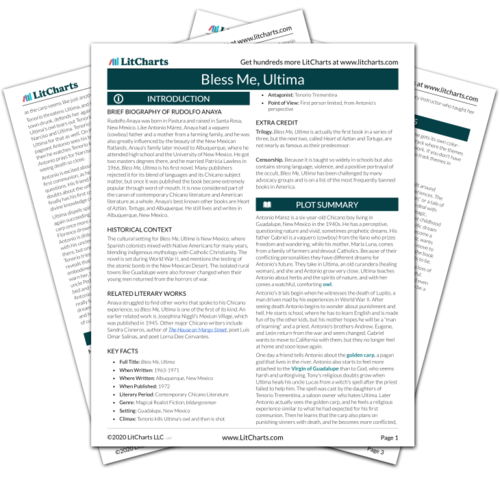 Retrieved April 23, 2019. https://www.litcharts.com/lit/bless-me-ultima/chapter-7-siete.